I am currently clearing my shelves of some books (selling, gifting, donating) in order to get book boxes unpacked and I vowed yesterday that I would use the library from now on, but I am already breaking that no-more-books vow! I will order these books and probably make his blog a morning read. We are on a similar journey and it's going forward as fast as you can pour honey that's sugared up. 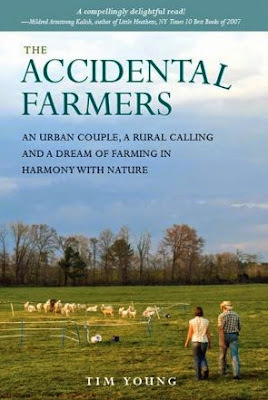 We are planning a retirement farm, rather a change of career, and it's required us to live in two different states...miss my honey and it's a long drive back and forth but we do it. We didn't get the fencing in at our place in ID, so the county will probably drop our AG exemption. I will have to dedicate our savings to taxes rather than fence most likely until we can satisfy the county that we are a farm. Other matters had to be attended to first, such as my mother getting pneumonia and I went to MO to take care of her when she was released. The apples and pears didn't get picked, I didn't find a market or get them sold otherwise. I created a FB page to document our journey, but didn't have the heart to write about what didn't get done. I have also found that at the end of the day, I don't have much time or energy to post. We haven't lost hope, and we wake up every morning and begin the day with a glad heart that we are at least getting to try to achieve this dream. I am thankful for people that openly and honestly share their experiences. Your blog alone has helped me tremendously; it's helped me to narrow down what it is I want to do (beef, chickens, bees, orchard and garden). I have a small orchard of 25 apple trees, several cherry, and two full sized pear trees. I have a place for the garden. It has several inches of gravel in it, as I learned from you that the voles/moles will decimate the efforts of any gardener. It was a blessing that the space and gravel was all ready here when we purchased this place. I've planted some strawberries, asparagus and onions. I have a source for the breed of beef cattle I want to raise. I think these books will be a source of valuable information and encouragement and I am excitedly looking forward to finding a spot for them in the shelves. If you know of any ID homeschool sites where families exchange information, or county sites (I live in Benewah), I have some books to give away. Thanks for sharing this information. I'll definitely check out his site and the book! Thanks you Patrice! I will add it to the reading list. Gosh, this is better than sports! I found myself totally enjoying the first few paragraphs, cheering as I read and making plans to read this book, and THEN I got to the place where Patrice wrote "...Mr. Young contacted me -- me! -- "... I was laughing out loud at that point. One of the most humble giants of canning/farming/blogging/milking/cattle/cheese making/home schooling/etc comes face to face with an admirer that she admires. Better than the Super Bowl!!! Your daughters may understand this reference more easily, but did Captain Picard realize the power of his Captain Picard-ness? Patrice, you are already one of the LEGENDS. Go get 'em! I recently attended a cheese class at Nature's Harmony Farm by Tim Young. He is the real deal! His class was excellent too, if anyone near Georgia wants to ever learn a ton about cheese making! I learned a good bit about Ossabaw Island pigs, which we now raise way back from Mr. Young's Nature's Harmony website. I also recommend his fiction novel "Poisoned Soil" I loved it, couldn't put it down! 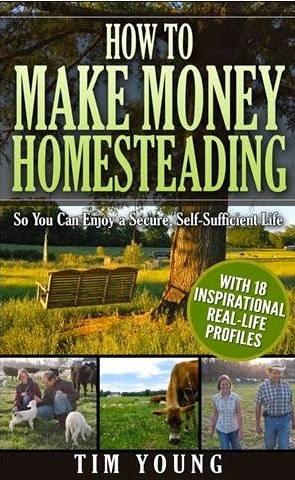 I bought the "how to Make Money Homesteading" based on your recommendation. I devoured it in one day! We just purchased a new home with 38 acres and were scared about the property taxes. This gave me all kinds of suggestions on how to make money off our land. I can't wait for Springtime to get started. Thanks so much!